Inspiration is everywhere! Muse is a fickle friend. I got the inspiration for this dish from seeing a marinade bottle. I seasoned this chicken breast in ground and fresh grated ginger; a little thyme, sage, and ground mustard; with a dash of garlic with sea salt and cajun seasoning. I injected it with injectable marinade and then coated it with just a little sesame ginger marinade. I then baked it. The rice is a mixture of long grain and wild rice. I added a small amount of sesame seed oil, sliced almonds, and a hand full of sesame seeds to give in a more Asian flavor. I also seasoned it with ginger, garlic, sea salt, and a splash of soy sauce. I made a dipping sauce out of a little of the sesame ginger marinade, teriyaki sauce, fresh ginger, garlic, and sesame seeds. I also paired this dish with a Japanese beer Kirin Ichiban. If you like beer and haven’t tried it, What are you waiting for? 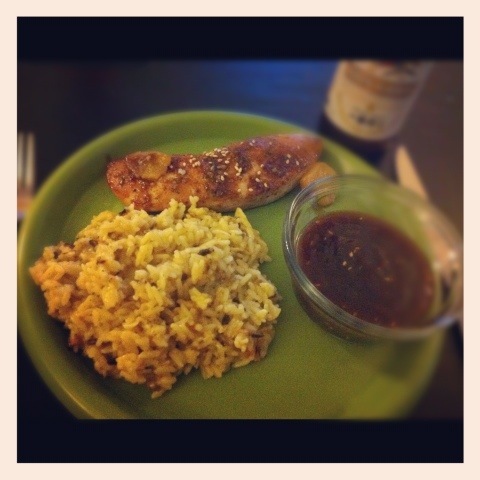 It may not be authentic or found in a hibachi grill, but this Asian inspired dish was delicious and very easy to make! Finally! 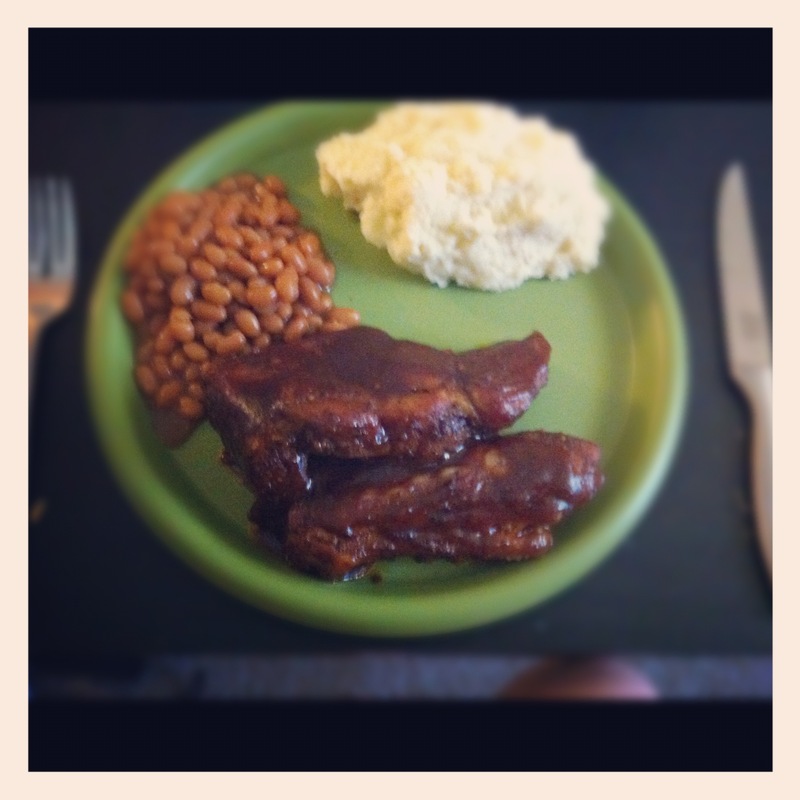 The full post for my Independence Day Ribs! Beer makes an excellent marinade! First I seasoned the ribs with sea salt and garlic then submerged them in Abita Restoration Ale. I let them soak in the ale over night, approximately 12 hours. 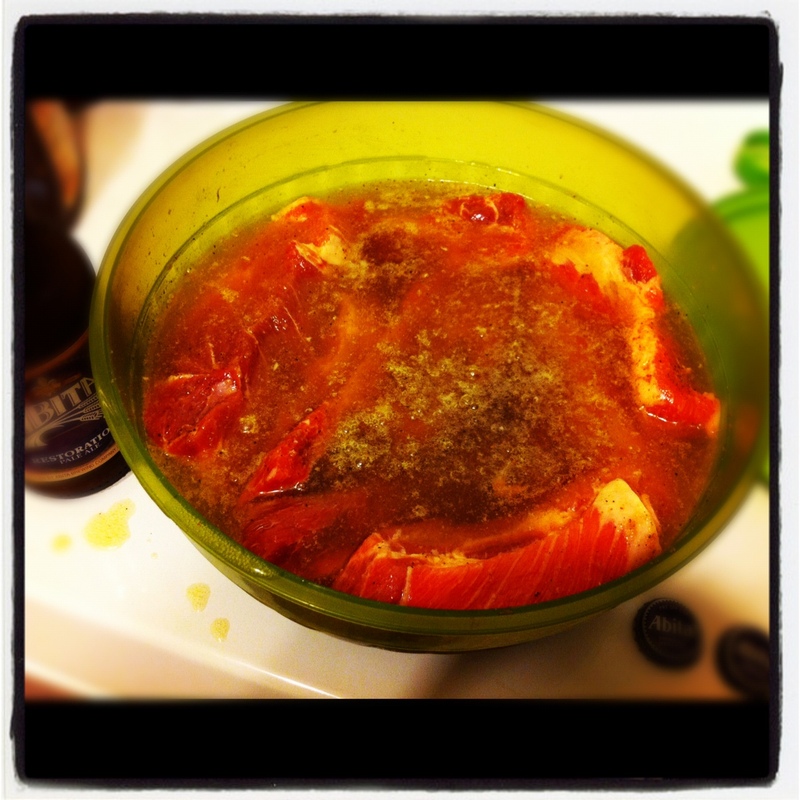 Some other good suggestions for marinating with beer are pretty much any Abita, Kirin, Shiner Bock, and Killians. First thing in the morning, I removed the ribs from the bowl of Abita Ale. 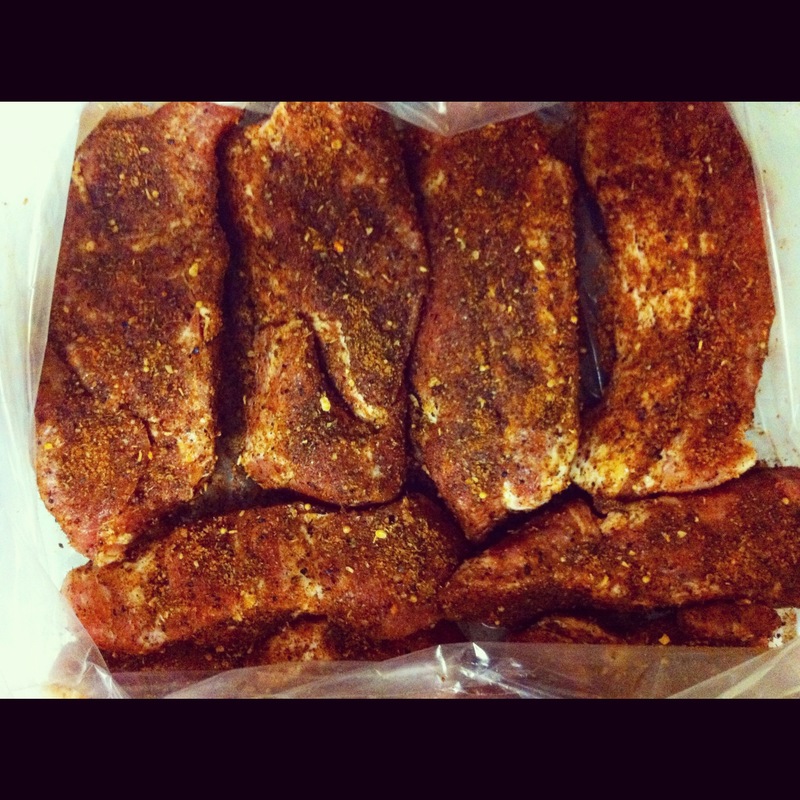 I placed the ribs, single layer in a Reynolds Oven Roasting Bag and coated them in a dry rub. This should be done to taste. Use your favorite dry rub or one that will go with your chosen sauce the best. After cooking in the oven on low heat for an hour and a half, the ribs came out fall a part tender. I had to use a spoon and tongs just to turn them over to coat in sauce. I carefully moved the ribs from the oven bag to the baking pan and coated them in my own mixture of sauce. I made a blend of a few sauces, combined with a little seasoning. This is where you can have a little creative fun. Play around with sauces and flavors. Try something new! 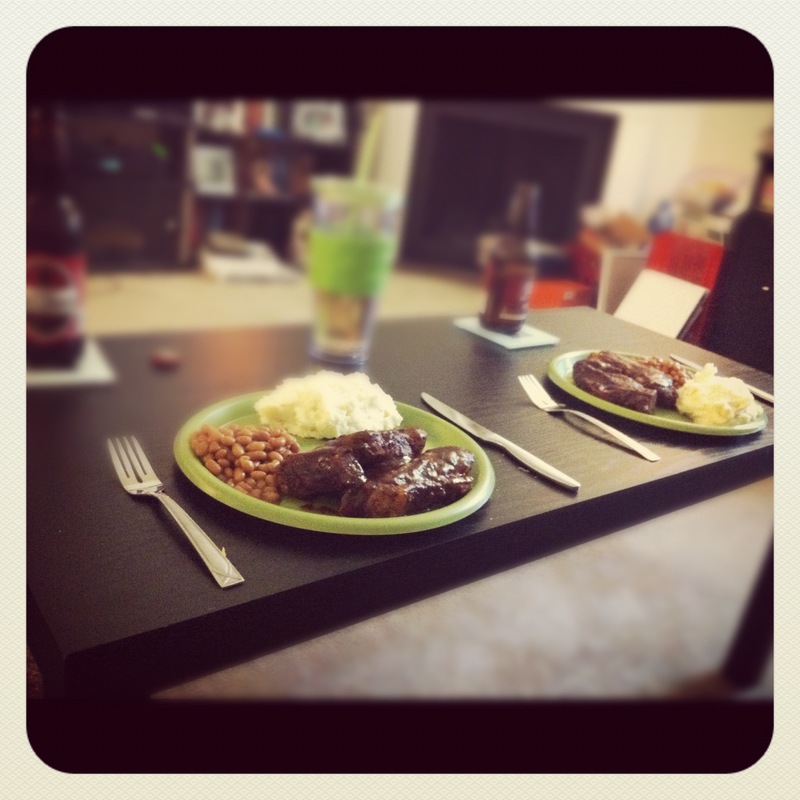 Paired with baked beans, garlic mash potatoes, and cold beverage, these melt in your mouth ribs were definitely the hero of this meal!